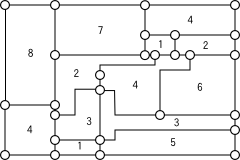 H. Nagamochi, T. Ibaraki, Computing the edge-connectivity of multigraphs and capacitated graphs, SIAM Journal of Discrete Mathematics, 5, 1992, pp.54-66. Takuro Fukunaga, Hiroshi Nagamochi, Network design with edge-connectivity and degree constraints, Proc. 4th Workshop on Approximation and Online Algorithms, LNCS 4368, 2006, 188-201. 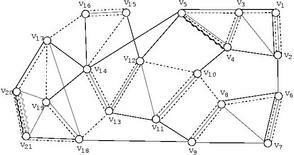 A. Kawaguchi, H. Nagamochi,Orthogonal drawings for plane graphs with specified face areas, Proc. the 4th Annual Conference on Theory and Applications of Models of Computation, LNCS 4484, 2007, 584-594.